I always go back and forth on which time of year is my favorite. They all have such great moments or things to be had within each one. Though, after last night and some before bed thinking I’ve come to the decision that Fall is my favorite. After a delicious Spring and hefty Summer, Fall wafts in and carries with it such great anticipation for whats to come that immediately gets me excited. It is Fall that reminds me to slow down, breath deep and savor small moments. Fall tends to lean towards comfy, warm and spicy sweetness. When I think of Fall I think of sparking up and illuminating a yummy scented candle and soft, fluffy spiced muffins. Fall gets me thinking of upcoming family time, turkey and stuffing, ice cold mornings with hot coffee and wrapping gifts for my children … all those thoughts send a delightful thrill down my spine. When I was in my twenties Summer ranked high, as a child Christmas was the obvious choice. Now at 32, I am happily confident that Fall is my most favorite and cherished time of year. Fall as it may be, here in Los Angeles it seems to still be Summer as today and tomorrow promise to be 102 degrees. But, I’m forcing Fall with decor, costumes and a recent trip to the pumpkin patch! Last weekend we made our annual trek down to our tiny pumpkin patch. We’ve been visiting this pumpkin patch as a family ever since Ryan’s first Halloween, and I’m happy to report it hasn’t changed in over seven years! Even the decor is the same, albeit a bit wonky. I love it so! It is the perfect size for our toddling Mila. She ran through the aisles of pumpkins pretty quickly trying to find the perfect one. I loved seeing her excitement over the ‘punkins’ as she calls them. 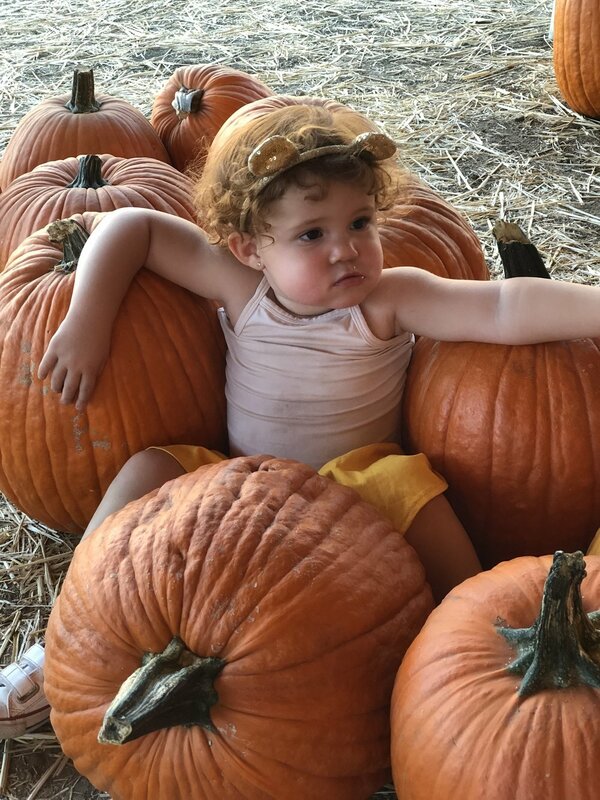 She really became one with our pumpkin patch. We most likely will make another quick visit this week before it goes away until next year. After we snag our pumpkin at the pumpkin patch we typically head home. This year though we stopped at a new taco place just up the street! Within a few minutes after ordering we established a new family tradition! First we visit the pumpkin patch and then we head for the best carne asada tacos and caramel churros in town! You guys know I am a sucker for family traditions and it brings me such joy to bust them out year after year. Truthfully, what really gets my heart beating fast is creating new family traditions and I love that this one just sort of happened so naturally. I’d love to hear your Fall family traditions! Let me know, and keep an eye out for when your family can establish a new one! Happy Fall Friends! *All these photos were taken on my iphone. We brought our big camera but it was just too much to carry and run after Mila haha! Friends! I have a really great pumpkin muffin recipe with a tasty filling for you this week. I love making these this time of year as it is ‘Pumpkin Spice Everything’ season. If you aren’t a fan of pumpkin, no worries I’m also including a few simple tips on how to have your toddler help you in the kitchen. So, regardless if you bake these muffins or something else I encourage you to have your little ones help along the way in the kitchen! These muffins are fluffy and I have added a sweet crunchy filling with pumpkin seeds to really ramp up the pumpkin taste. I love giving muffins texture with adding streusel or nuts into the mix! I brought my daughter Mila into the kitchen with me while baking these delicious muffins. I always love having my kids in the kitchen with me. I think our kitchen is the hub at home for memories. It is also the place we foster our family traditions of weekly pizza night, our morning breakfast routine and seasonal baking like these pumpkin muffins or holiday sugar cookies! I’ll be totally honest, incorporating your children into the kitchen can seem a bit daunting and let’s face it … you’ll have a bit more of a mess. Though in the end the mess can be cleaned and the memories will last a lifetime. I love remembering times in the kitchen with my family growing up and that is one thing I want to give my own children. Happy childhood memories in the kitchen. So, now that Mila is almost two (when did that happen? slow down time!) I try to prepare as much as possible prior to bringing her into the kitchen. Just to keep us both in good spirits. So for this muffin recipe I pulled all the ingredients out and had them pre-measured. I also bake with Mila in the late mornings as she is still full from breakfast and in a happy mood. Try and choose a time during the day when your child is at their best when having them help in the kitchen. For example you wouldn’t want to try cooking with them right before nap time or if they are hungry for lunch or what not. Mila loves pouring things and mixing. So having the ingredients already measured makes it easy to have her just pour in. This way she isn’t waiting for me to measure things and pulling at my arm. You know how toddlers are ;) I let Mila have her way with the whisk and stir until her heart is content. One of my most favorite things to do with Mila while baking is prepping the baking pans. Especially for cupcakes or muffins. She is really into counting things right now and gets up to 5 or 6 already which always makes me thrilled and a bit teary eyed. I have her put the muffin cups into the muffin pan and count as we go. We actually do this a few times. She gets really excited when I tell her to do it by herself. I try to make most things a “game” and Mila really gets into it. Once she is over it she basically tells me (when she starts to try and rip the muffin cups instead of play with them ;) and then we move on. Snacks typically help intermittently. 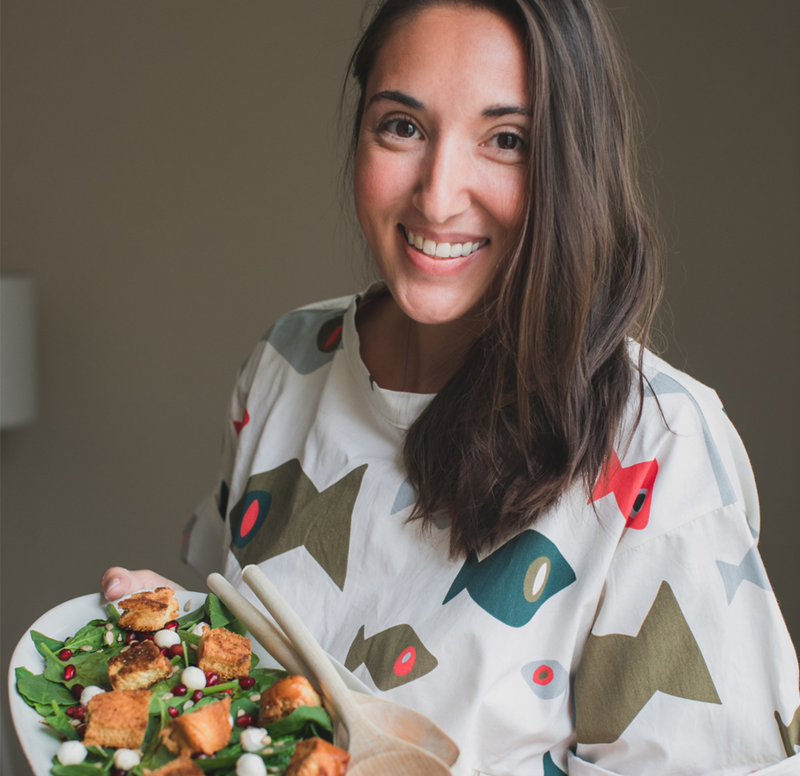 For this recipe Mila snacked on pumpkin seeds, but you can really pull anything easy out for your little one to keep them interested. I do always try to use an ingredient we are cooking with. With my son I used to ask him questions like "What does it taste like? How does it feel crunchy or soft?" I try and ask these questions with Mila but she is still a bit young to really grasp it. Though when your children are of age, try asking them questions pertaining to the different ingredients. This helps them learn more about foods and their tastes + textures. If you are like and don’t mind messes, I put 1/2 a cup of flour on baking sheet and let Mila play around with that as well. Don’t forget to have your phone handy to snap quick photos too! When things are baking and cooling Mila and I will typically color, stack/play with the left over muffin cups, play with flour or listen to music and dance in the kitchen. Honest to God. Whatever we do I try keep it all in the kitchen. Sometimes Mila rearranges my cookie cutters or food storage containers. I also collect Disney magnets and keep them all at her level on our refrigerator so she can play with them. Just try to play to your child’s likes and leave it up to them on what it is they want to do. This will keep the experience fun for them (and you). I tried to have Mila scoop the batter into the muffin cups and she wasn’t into it at all. So I had her stop and we moved on. If you child gets frustrated or shows that they just aren’t into it, move on to something else. They don’t have to do every step in the recipe. The best part really is the taste test in the end. Enjoy what you made together and share it family. Your child will be so proud of themselves! Be Sure To Have All Your Ingredients Be At Room Temperature To Ensure Your Batter Is Smooth. In a large mixing bowl, whisk together the; pumpkin puree, eggs, softened butter, brown sugar and vanilla until smooth. In another mixing bowl sift together the; flour, salt, baking powder and pumpkin spice. Sift twice to achieve a really nice textured muffin. With a spatula fold together the wet and dry ingredients until combined. You'll want to fold the ingredients together slowly and stop as soon as the batter comes together. You don't want to over mix, this will keep the muffins nice and fluffy. In a small bowl stir together the last 2 tablespoons of softened butter, 2 tablespoons brown sugar and pumpkin seeds. Line a muffin pan with muffin cups and pre-heat the oven to 350 degrees. Fill each muffin cup with 2 tablespoons of batter. Then add a bit of the pumpkin seed mixture to each muffin cup. Lastly, top each muffin cup with the remaining batter. Be sure to leave a little room at the top of each muffin so they can rise when baking and not spill over. If you have any left over pumpkin seed mixture, sprinkle the rest on top each muffin. Bake the muffins for about 20 minutes or until risen and fully cooked. Be sure to use a toothpick to check if the muffins are ready to be taken out of the oven. If you poke the toothpick in the center of a muffin and it comes out clean, they are finished baking. If the toothpick comes out with batter on it, give the muffins a little more baking time. Let cool on a baking rack, but enjoy the muffins slightly warm. I recently went to the grocery store and purchased all I could to re-build my Fall-Winter baking arsenal. Last season I was deliciously eating my way through my pregnancy. With my daughter Mila actually due on Christmas I seriously baked all I could and ate every crumb. Our families theories on why Mila is such a happy child varies, though I know it is because I fed her all the sugar while in utero and together we started listening to Christmas music early October. How could you not be happy with that combo? Guilty, I am a huge fan of jump starting the Christmas season. I do love me some ginger snap cookies, in fact they are my favorite and this little bakery cafe near my house serves the best I've ever had! I do make a good ginger cookie myself, but as it is the time of year to layer every food item with pumpkin flavor I followed my gut and added the pumpkin. 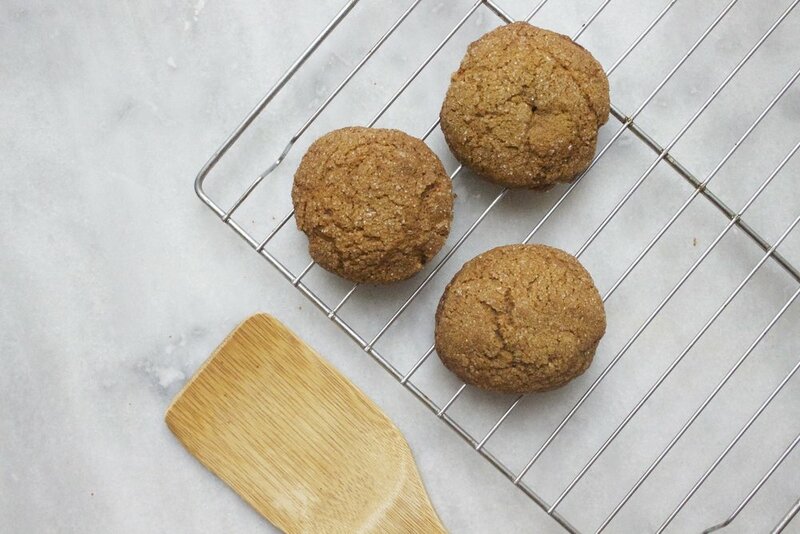 My ginger cookie is great little morsel, fluffy yet chewy. With the added pumpkin I swear it takes them to another level of greatness! Have you ever made something in your kitchen, taken a bite and then shock yourself with how talented you are? I had that moment when these cookies came out of the oven. I also whipped these up within an hour of arriving home after a weekend away in San Fran with my family. Dan was taking a nap, Mila rummaging through my plastic mixing bowls on the kitchen floor. I had a hankering to bake and to "pumpkify" something...Thank God! They turned out awesome. I do hope if you re-create these cookies within your own kitchen you do so alongside your family. 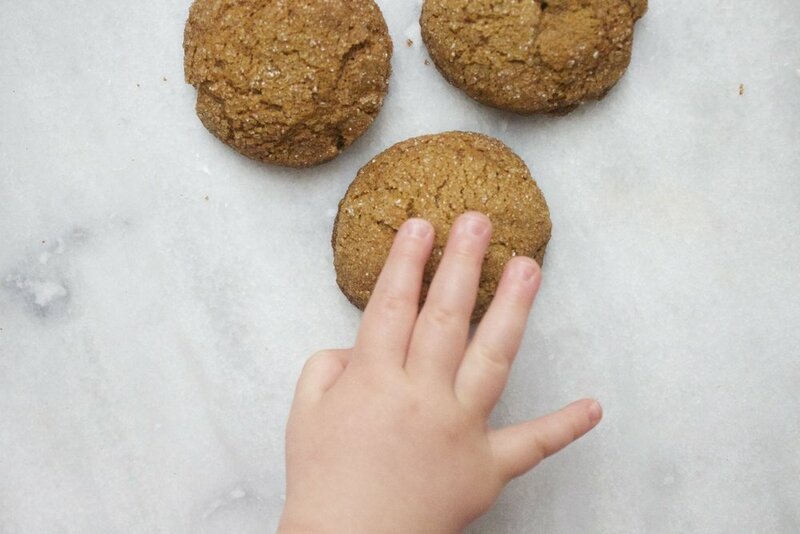 I think baking recipes are the best to bring in little ones and have them help out. I'm a sucker for children cracking eggs and mixing ingredients with their tiny yet mighty hands. I believe some of the best memories can be made within the kitchen. The kitchen can also be such a great backdrop for learning! Make these cookies a festive tradition that celebrates the start to an epic baking season. Try adding these cookies into lunch boxes or enjoying them as an after school treat. These cookies travel well in air tight containers, try delivering them to family members or taking them along on a family adventure! I always love bringing along a homemade treat while traveling. It brings along a bit of home while away. As we gear up for family adventures this holiday season, we may be on the look out for accommodating places to stay with little ones. I wanted to share a favorite of ours when we plan our family adventures. Kid & Coe is a great place to find a beautiful home away from home while traveling. All their spaces are great for families with little ones of all ages. You can check our more here. First time users can also use the code babyboybakery for a $50 off their next adventure. Here is to a great adventure and homemade treat filled season with family! Smoothie making was a huge thing in our house. It always will be. When I think about mornings with Ryan, I think of smoothies. Well, I think of a lot of things that made up our morning routine. But, smoothies were definitely an important factor. It started the year before last when Ryan fell in love with Jamba Juice or "Juice Jamba” as he would say. I took him there on a whim before walking to the park. I told him it was a special treat. He drank the whole thing in less than two minutes and declared it the best kind of drink because of the straw. He loved drinking from a straw. He started asking for "Juice Jamba" often and then I decided to just start making them myself. Because those suckers aren’t really that healthy, and the cost adds up quick. I bought fun colored straws and all kinds of fruits to blend up. I started freezing the fruit for colder, thicker smoothies and played around with fruit and veggie combinations too. I could pretty much blend up anything and Ryan would slurp it down, so long as he got to choose his straw. Smoothie making turned out perfect for squeezing extra greens and healthy things into his body. Every morning he would help me pull out all the ingredients from the fridge and lay them out on the counter for me. I would pull the frozen fruit out of the freezer and take out his favorite cup. Ryan would think long and hard about which colored straw he would want to use on that particular morning. He usually always chose the green straw because there were no red straws, and the pink straws were always for me. "Mom, you have pink." Can we go to the park instead of pre-school? Why does Caillou have no hair? I miss everything, but mostly his voice. His laugh. His thoughts moving through his mind out to his little mouth. Now a days smoothie making has resumed. It is a lot quieter as it is only me in there. But my son loved making smoothies every morning, and I need to pick back up from where we left off. I pull all the ingredients out, just he would and spread them all over the counter. I think about all of Ryan’s favorite things. I replay his words and actions in my mind. I carefully choose which color straw to use. I now bounce between green and pink. I wonder if he is watching me. When I think of him watching me, I smile. All these things may seem so small and meaningless, but I assure you they mean the world to me. Something as simple as making a smoothie became such an important routine. It was an adventure every morning that Ryan and I got to experience. I miss it. I miss him. I hope you can make smoothies too, I'm sure most of you do. You can make them with your little loved ones. You can get creative like we did. Ryan will love to see you choose your straws. You can click here to see a past blog post where Ryan and I created some kid-friendly smoothie recipes. Feel free to mix them up and create something of your own liking. Ryan most likely would not have liked this. But I love it! So I thought I'd share with all my pumpkin lovers out there. -I like to freeze all my fruit for smoothies so the texture is thick. 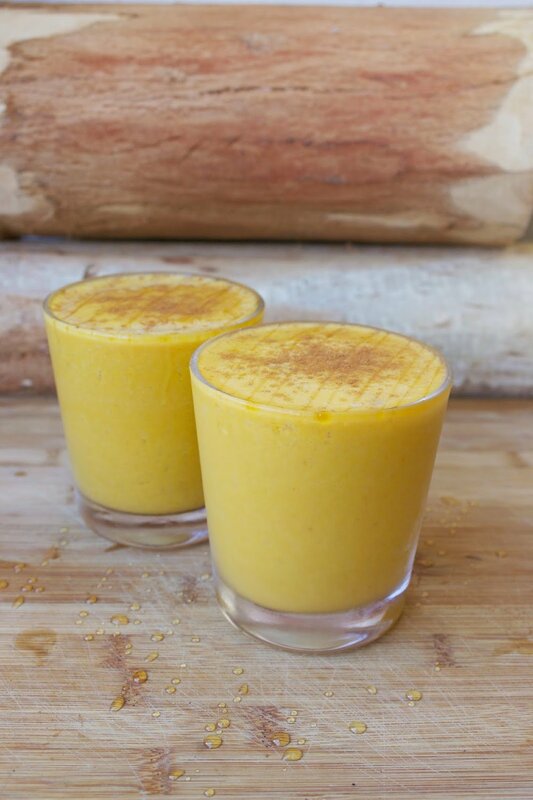 I start out by freezing my pumpkin puree in ice trays the night before I make this smoothie. Though you don't have to freeze if you don't want to. -Toast your oats tossed in cinnamon in the oven for a quick 3-5 minutes at 375 degrees. Again you don't have to do this either, I just like the texture and flavor. -In a blender pour in your almond milk. I say 1/2 cup, but make sure it covers your blender blades completely. You might have to add more milk in if the smoothie is too thick. -Now just add the rest of ingredients (except maple syrup) and blend till smooth. -Pour into a glass and drizzle the maple syrup on top. I feel like since Starbucks has started pouring their Pumpkin Spice Lattes again everyone has been pumpkin hungry! My favorite blog has been doing a pumpkin series and it has been so dang hot I'll be honest...I have been praying for Fall every night. "Please Lord...It is me Jacqui. Can you please turn down the heat?" Right now I wanted to share this super easy recipe for the best little pumpkin muffins ever! Since this recipe calls for box cake mix there really is nothing to it! I’d make these for a party or if you ever need a quick and delicious pumpkin dessert recipe. I call these muffins but there really are more of a cupcake. 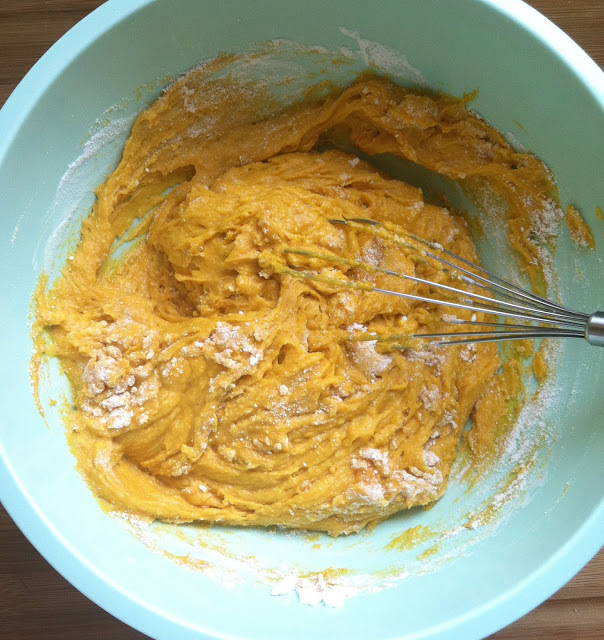 `Whisk all the cake mix, pumpkin, oil, egg and pumpkin spice until a batter forms. `Bake muffins at 350 for about 10-15 minutes. `For a yummy glaze try mixing 1tbs cinnamon 1/4 cup powdered sugar and a little water until a glaze forms. Spoon over the muffins and enjoy!